The Nord Electro 4 is an update to the Electro series, encompassing everything offered in the Electro 3, and adding in a host of new features like the acclaimed Nord C2D B3 tone wheel simulation, 122 Rotary Speaker simulation, improved Key Click and Percussion, and so much more. The Electro 4 is a high-performance, lightweight synth with the power and precision to perform on stage and in the studio. Changing, editing and storing presets is a breeze with the Nord Electro 4, and there are also 4 Live memory locations that automatically save what you're doing. The Program memory can hold 128 different Programs, organized in 32 Pages with 4 Programs each. 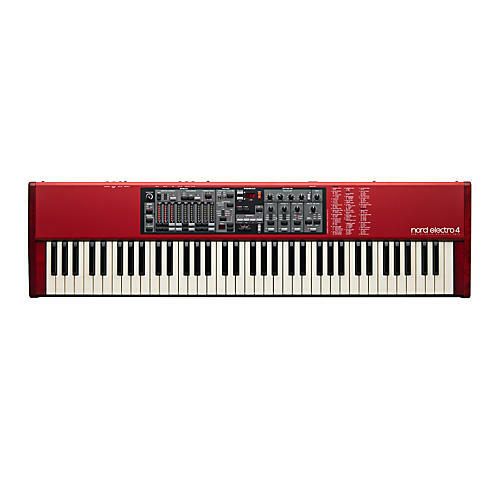 This version of the Nord Electro 4 uses amazingly portable weighted hammer action piano keys. Perfect for electric and acoustic piano sounds, although the High Trigger-point mode even works great for organ playing. Key range E-E. The Nord Electro 4 features the B3 tone wheel organ engine from their flagship organ Nord C2D and includes a redesigned Key Click simulation as well as the Rotary Speaker simulation of a vintage 122-unit with a great new overdrive. The percussion model has been improved to offer increased control over the percussion levels when playing near-legato. Naturally, the vibrato and chorus scanners have been carefully modeled to be just as alive as the tone wheels. The Farfisa and Vox models are just as impressive as the B3, simulating the behavior and unique response of the original instruments. The Farfisa Compact Deluxe, considered by many to be the mother of transistor organs, involves routing matrixes and complex filter combinations that offer a tailored sound with massive energy and high-end. The Vox Continental's brute design brings you a more hollow tone, but with a very intense character. Both these transistor organs have their own unique, irreplaceable personalities. Combine them with any of the Amp simulations, add some distortion, adjust the EQ and they will definitely get you through any organ gig with flying colors. The Nord Electro 4D is also fitted with physical drawbars, the same type as the Nord C2D, which is perfect for actively shaping the sound on the fly. The Nord Electro 4 comes loaded with a selection of amazing sounds from the Nord Piano Library - a specialized library for Grand, Upright and Electrical Pianos, Clavinet and Harpsichords. All the sounds have been recorded using state-of-the-art sampling techniques to capture the extraordinary nuances and unique characters of the source instruments and covers everything from brilliant, factory new Grand Pianos to detuned upright bar pianos with tons of charm. The Nord Electro 4 series support the Nord Sample Library, giving you access to exclusively licensed Mellotron and Chamberlin sounds and a wide selection of quality sounds from leading sample producers. The Nord Sample library is updated on a regular basis and all new additions can be downloaded for free! The Amp/Speaker simulation now features the same Vintage 122 Rotary Speaker simulations as found in their flagship Nord C2D organ. Also, there's a flexible Stereo Delay effect with Tap-Tempo and Ping-Pong mode.